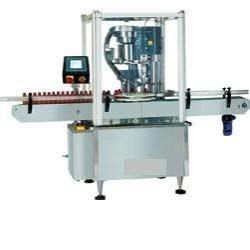 Exporter of a wide range of products which include single head screw capping machine. Change parts are available for different size of caps and bottle diameter.It easy to set for different bottles. The tightening torque of the head is adjustable as per requirement,. 1 Hp drive motor with gear box .Clutch type starwheel ensures no damage to bottle or cap. Output of 50 bottles per minute.Can be added on to existing lines. Looking for Screw Capping Machine ?